Check out the two links below from the Contra Costa Times and their great writer Phil Jensen who covers Cross Country and Track and Field as well as any writer in the Bay Area. First team: Nicole Hood (Carondelet), Heather Cerney (Carondelet), Alycia Cridebring (College Park), Diana George (Livermore), Kellie Houser (Carondelet), Colleen Lillig (California) and Grace Orders (Campolindo). First team: James Attarian (Dublin), Nate Beach (Acalanes), Matt Duffy (St. Mary's), Jeremy Grace (Dublin), Bhavik Kanzaria (Monte Vista), Wyatt Landrum (Liberty) and Jack Leng (Castro Valley). The town known for chickens and arm wrestling can now add cross country to its ever growing list of claims to fame. Following their 2nd straight sweep at the SCL final, the Petaluma boys also won their 2nd straight NCS Division II title and then accomplished much more at the state meet. 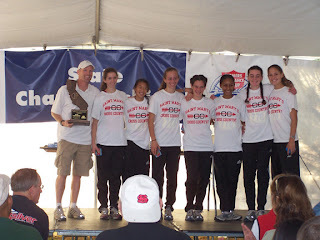 After their 5th place finish in the previous season ('06), the majority of the team returned this year to finish 2nd behind one of the top teams in the nation, Loyola. 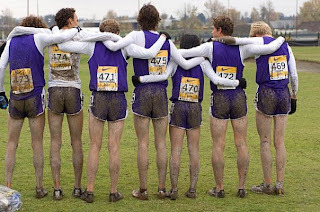 The following week, the team traveled north to the Nike Team Nationals in Portland, Oregon (picture of team above courtesy of Bill Yungert following their race) and in the tough conditions finished an impressive fourth in the open race. 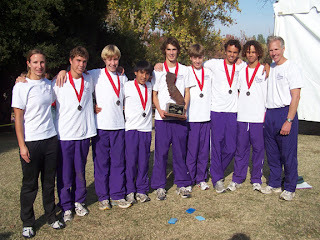 With all those accomplishments, the Petaluma Argus Courier recognized the boys' cross country team as their top sports story of 2007. Will Petaluma be known as the cross country capital of the world anytime soon??? You can find the complete list at the link below. If you are a true student of the sport of running, here are my picks for books that you must have in your own personal library so that you can have them at your disposal at any time. I also included the last book I just finished reading, Pistol, an incredibly detailed look at the life of "Pistol" Pete Maravich, one of the greatest basketball players ever who's life ended much to early at the age of 40. Of course there are other books that could be included so if you have a must read of your own, please add it in the comments section below. In baseball, you have the Giants vs. Dodgers, the Yankees vs. the Red Sox, the Cardinals vs. the Cubs and many other bitter rivals. In basketball, it used to be the Celtics vs. the Lakers (ah the greatness that was the 80s basketball). In football, you have the Patriots vs. every other team trying to knock off the wanna be Niners :D. In distance running, there is only one true rivalry and that is Kenya vs. Ethiopia. In this documentary I found on my friend and yours, youtube.com, here is a historic look at this great rivalry. When you list the top runners in the history of distance running, many come from these two countries and that list includes Abebe Bikila, Kip Keino, Mamo Walde, Miruts Yifter, Henry Rono, Paul Tergat, Haïlé Gebresélassié, and the most dominant current runner, Kenenisa Bekele. What other great rivalries are there or have been in distance running? The two links below have the all league members for the West Bay Athletic League (WBAL) and the Peninsula Athletic League (PAL). An old school classic from one of the best rap groups ever as we head toward December 25th. Courtesy of Hank Lawson's website Lynbrooksports.com. You can find the link to all the team members which includes the All CCS team, 2nd team, honorable mention, MVP and 9th, 10th, 11th and 12th grade runners of the year. All NorCal Team will be posted next. Flotrack.com is holding a contest with the best uploaded video winning a pair of flights, hotel accommodations and tickets to the track competitions at the 08 Beijing Games. The following is the description of the video uploaded by Campolindo coach Chuck Woolridge. The link to the video is at the bottom of this article. 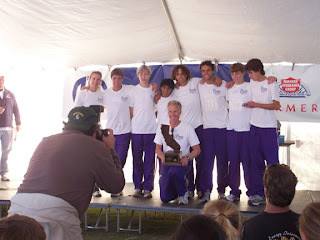 I am the xc and track coach at Campolindo High School. Each summer our varsity cross country athletes spend four days at a cabin in the Sierras. It is a chance for the kids to set goals for the approaching season and bond. It is also an opportunity to run on some beautiful trails. I've wanted to put together a film that would capture the spirit of high school running, and focus on the competitive anticipation that drives successful prep athletes for a while. I'm also a fan of "The Harriers", a film made in the 1960's featuring the Humboldt State cross country team, and more recently, of the various running movies like "Five-Thousand Meters" that are now celebrating the new generation of American distance talent. I asked one of our kids if I could borrow their video camera and took it with us on the trip. When I returned home I spent about 72 hours editing the footage with iMovie. The interviews with the athletes were a last minute idea we did as the kids were cleaning up the cabin and packing the vans for the return trip. They ended up being the anchor points of the film. We've had great response from those that have watched the movie on our web site: http://www.campotrack.com/xcPAGES/2007xcPAGES/2007movie.html Thanks to Flocasts for the opportunity to get this out there for more folks to see. And thanks for everything you guys are doing to promote the sport. You think you are a dedicated runner? This man has run at least 1 mile EVERY day since January 1, 1975. Read about his amazing streak at this link from espn.com. Interesting that his streak is only 11th on the list of continuous running streaks in the US. 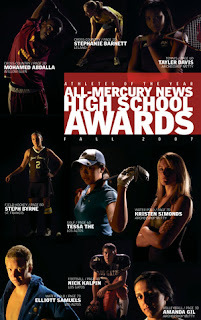 All-Mercury News teams and players of the year were chosen from 43 schools in Santa Clara County. Selections were made by Mercury News high school sportswriters Dennis Knight and David Kiefer; all-league teams were picked by coaches and submitted to the Mercury News. All-NorCal team will be posted around Xmas time. •Link to training and coaching articles from EVERYTHING TRACK & FIELD. Today we catch up with Palo Alto boys' Cross Country and Track and Field coach Jeff Billing (seen here standing on the left next to his uncle, Amby Burfoot). He has been teaching and coaching at PA since 2004. During his short tenure, his teams have won two varsity league championships including this past season's title as his boys upset Mt. View and Santa Clara to win the SCVAL El Camino crown. Burfoot, for those of you that are not aware, was the 1968 Boston Marathon winner and is the Executive Editor for the magazine Runner's World. You can read his account of Jeff's effort this past year at the Manchester Road Race (in Connecticut) as he ran the race for the 16th consecutive year at this link. 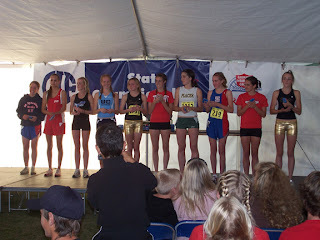 1) How did you get your start in running and describe briefly your competitive time in the sport? I would have to credit my family for getting me started in the sport. My father, who after a college baseball career decided to start distance running, fell in love with the sport and became a sub-2:45 marathoner. Both of my uncles from my mom's side (Amby & Gary Burfoot) were star high school runners - Amby went on to have a great college career and eventually won the Boston Marathon. On holidays like Thanksgiving & New Years Day, while other families might watch football, its running events that have always been central to my life. (On Thanksgiving Day its the Manchester Road Race in CT. On January 1st its the "New Years Day Run & Swim" that starts at John J Kelley's house and finishes *in* the Atlantic Ocean.) My dad has done each of those for over 30 years in a row... every year of my life and then some! 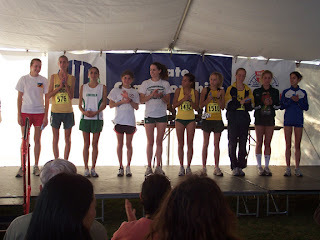 As for me, I guess I officially started running in 6th grade when I joined the middle school XC team. 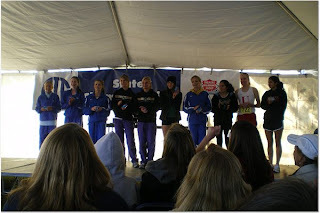 I ran every fall season from then till my grad year of college - 12 years in a row. I didn't start out as someone who *loved* running - the love I have now for the sport started small but has steadily grown, and continues to grow. 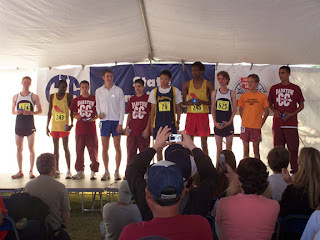 In high school I ran because I was good at it and the coach & the team were fun. My PR's are from indoor track where I ran 2:06, 4:40, 10:07 for 800, 1600, 3200 respectively. I was actually a much better baseball player than runner, so throughout high school & college I played ball in the Spring. 2) How did you get your start in coaching? How long have you coached at Palo Alto? Did you coach anywhere else before Paly? My last year in college I was pretty sure I wanted to coach running at some point. I remember asking my coach to sit down with me before the XC season and show me how he plans out the training for an upcoming season. Then, when I graduated I moved to California to work for Oracle, and immediately started coaching... Little League. It wasn't till I left Oracle and got a job teaching that I wound up at Paly. This was in 2004. I had never coached running before and got to help out with both girls and boys teams working with Paul Jones, Paly's long-time coach who still coaches the girls. 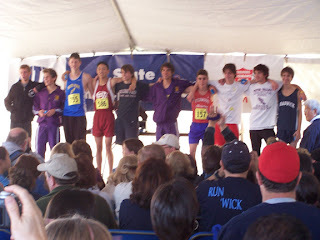 In 2005 I was given the Boys XC team and we won the Leagues that year riding a 1-2 punch of Scott Himmelberger & Francis Reynolds. The boys hadn't won leagues in 15 years, so that was pretty cool to do it my first year as head coach. 3) Who do you consider as your coaching mentors? Man, there are lots of people I would say are my coaching mentors... I'll pick two: The first person has to be my father. For his first 25 years he wasn't a runner. Then he trained for a year, ran a 3 hour marathon, and he's been a runner every day of his life since. He simply loves the sport. Thats the most important thing I think a high school coach can bring to the table - arrive at practice every day excited to share this great activity and lifestyle with young impressionable human beings. The next would probably be John J Kelley. He was Amby's high school coach. At the time he was also the top marathoner in the country - he competed in two Olympic marathons. He and his wife Jessie were like grandparents to me as I became an adult. I never saw him coach, but I've talked with so many people who ran for him about what he was like, what it was like to run for him. It was never a chore. It wasn't about doing killer interval workouts. It was a balance of running slow, running long, definitely running hard... but all the while learning about each other, learning about yourself, learning about the Earth. Finding meaning in what you were doing, forming bonds with the people you're doing it with. 4) What are the advantages to being a teacher on campus at the school you coach? I can't imagine coaching somewhere that I wasn't teaching. What I love about teaching & coaching is the bonds that are formed: between me and the kids and between the kids themselves. I think being around the kids in different environments increases our mutual respect for one another. I realize that their world has many more things in it than running. They realize the same about me. I also love seeing packs of the kids hanging out at school together, especially when they're kids who hadn't really been friends before they joined the team, and now are inseparable. 5) You have a famous uncle. Can you tell us a little about him and any influence he may have had with your running and/or coaching. Amby was a great runner. He's an outstanding writer. People have heard of Amby Burfoot, and he's my uncle - thats always been pretty cool... What goes way beyond all that is that he's also an incredible uncle, father, husband, brother. His role in my life is pretty much beyond words. His values are unwavering. His compassion for others and tenderness with his family are things I've witnessed my whole life. They've shaped who I am and hopefully the type of father, husband and uncle I will be. As a runner, his biggest influence was the answer to the question every young runner asks: "Amby, how do I get faster?" I asked him when I was barely a teenager. His reply: "Jeff, when you're on a run, and you see a hill, run to the top, then run down the other side, then run back up again!" As a coach, he has really helped me working with Philip. 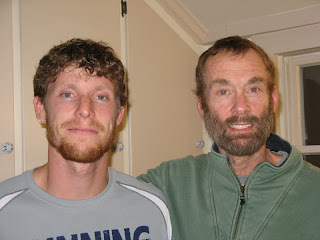 He's been a sounding-board for all the ideas that I have to work with this tremendous talent, and he's been a constant voice in my head reminding me that, for young runners, less is more. The key is for it to be fun, consistent, and for improvement to be gradual but steady. You don't do amazing things in one day, one week, one month or even one year. 6) Describe your expectations of your runners during the summer. Is there a team camp? Over the summer, I expect the boys to do a little more than they have done the previous off-season, the volume is pretty individualized. What I try to set up, and what we succeeded this summer in setting up, was to have a regular time every weekday over the summer where the kids know when & where to meet if they *want* to run with their teammates. We had a pretty steady core group this summer, and we also had great alumni representation as we have 4 boys running competitively in college right now. We don't have a "team camp" tradition, but this year we spent 3 days camping out in the hills with a group of 15-20 people. I hope that might stick as a tradition... we'll see what the kids do with it. 7) Where does your team do most of it's training around Palo Alto HS? Training from Paly is sub-optimal. Its really hard to find soft surfaces, which I think is really important. The boys do lots of runs around the Stanford campus, many runs include the hills of "the dish". We occasionally go to the Baylands to run and also occasionally get to the course at Crystal Springs or to Rancho or Huddart. 8) In regards to your training program, are there key workouts that consider important to your team's success? The training program is heavily focused on aerobic threshold training, with long-term goals. My goal as a coach is to create life-long runners. Winning a league championship is neat, running a fast time is cool, running in college is awesome... still loving running and being able to run when your 60 years old is truly incredible, and probably means you've lived a much happier & healthier life. If you want specifics, We follow a Jack Daniels training philosophy. On top of the threshold running we regularly do repetition work, we call them "Smooth 2's & 4's" where kids run mile pace for 200-400 meters over and over again with as much rest as they want. We just focus on having good form and feeling graceful over the ground. We do most of the above on grass or the "mulch" trail near the Stanford track. The last 6 weeks of the season we bring in traditional intervals - mile repeats, sets of 800's, ladders up & down. We try not to over-race, especially with our top runners, and I think we've been pretty successful the last 3-4 years of having our top runners in their best form at the end of the season. 9) Looking back at this past season, can you mention a few team highlights? This season was a special season. I had 20 seniors, an incredible group. We spent 5 days in Hawaii, every minute of that was special. Beating Gunn in our annual "City Championships" was certainly a highlight. Winning the League meet as huge underdogs on paper was incredible. The speeches made during our Captain Elections were quite memorable. Our banquet was awesome. But honestly, the thing that touched me the most was the "Thank you" card that the seniors gave me just a few days ago. 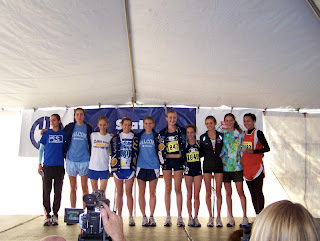 The things they said... well... they made me realize just how special this high school XC experience can be. 10) Have you caught yourself thinking ahead to next year's cross country season yet? I think as soon as the CCS race ended, I started looking forward to next year's race. We had a stomach flu that went through our team the night before the race and we had to sit out our #3, #5, and #6 runners. #3 and #5 I was expecting big breakthroughs from. We had a great race plan and a great vibe all week, and I really felt like we were going to win. As I watched St. Francis have the race we had dreamed of having, and then as we missed states by 12 points with runners 1,2,4,7,8,9,10 I couldn't help but start looking forward to next season. It'll be interesting though... with Philip & Charlie coming back we can run with anyone up front. Skyler, our #3, was in great shape in November, but never got a chance to show it. After that we're thin on paper. But I've got a list of literally 12-15 guys who could give us what we need. It'll be interesting to see if any of them take the opportunity and go for it. 11) What advice would you give to coaches that are just starting out with their careers? I sum up my philosophy in my seasonal speech to the boys where I tell them my 2 goals for them: (1) to have tons of fun and (2) to get really fast. I tell them that "fast" is a relative term. It means "fast" in November relative to what you could do in August. My philosophy is to accept anyone who is willing to work *hard*. The more the merrier. We have grown in #'s every year I've been at Paly, and the group as a whole has taken it more & more seriously. This year we had 60 boys. I think both styles have their merits - a new coach has to choose where his or her priorities are. What type of experience are you looking for? What type of an experience do you want for the kids? No, I already said too much. 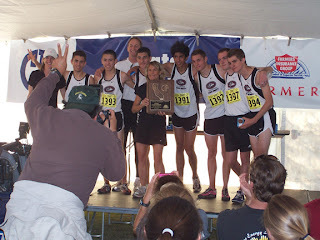 Now that Cross Country is over, I will post several interviews with several athletes and coaches who had breakthrough '07 seasons. 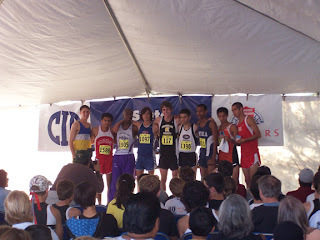 I will start with the best male runner in Northern California not named German Fernandez, Dublin's James Attarian. 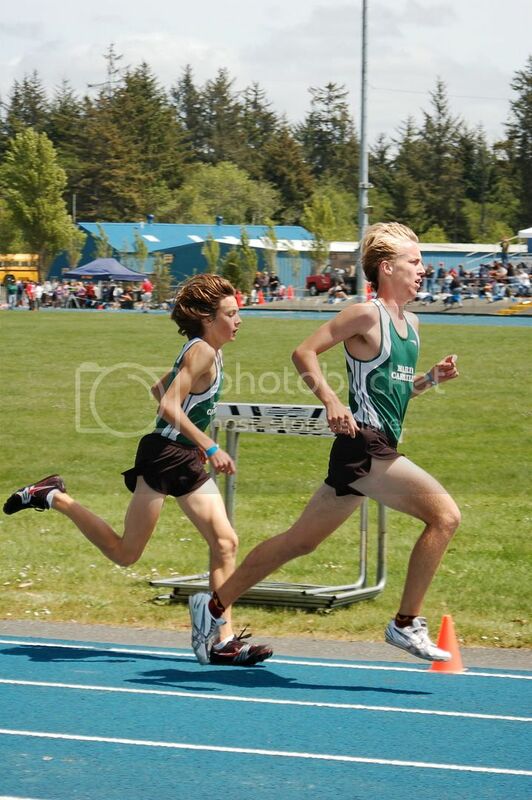 He made a name for himself last Track and Field season by finishing 2nd in the 1600m. behind Brian Cole of St. Helena at the NCS Meet of Champions with a speedy 4:17.87. Despite several other sub. 4:20 1600m. clockings on the track, Attarian came into the season under the radar as a runner to watch on the state scene. Early during this past xc season, he finished 2nd behind fellow DFAL runner, Nate Beach of Acalanes, at the DLS/Carondelet. From there, we'll let him tell us about the rest of his season which will go down as one of the best by any Northern California Cross Country runners. 1) What was the first race that gave you the confidence that this could be a special season? Stanford Invite because I had the second fastest time of the meet which told me I was competitive with the ranked runners. 2) Looking back at the entire season, what was your best race? At Mt Sac I felt the strongest especially on the uphill portions of the course. I really felt good after that race. 3) Favorite moment from this past season? Most surprising accomplishment? 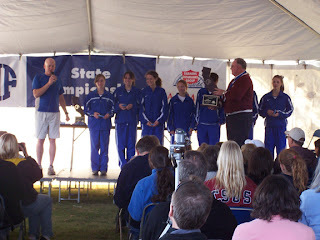 Favorite moment was winning State. That was my goal all season and to accomplish it was really great. 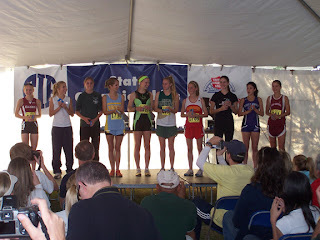 Most surprising accomplishment was bringing my times down as much as I did from last year. 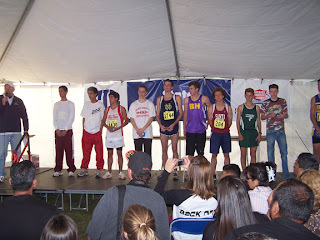 4) Was this your first Footlocker Western Regional? If not, was the previous experience helpful in qualifying for the national meet? 5) How confident were you in your chances to qualify for the national finals? I thought I had a pretty good shot at making the top ten and qualifying. 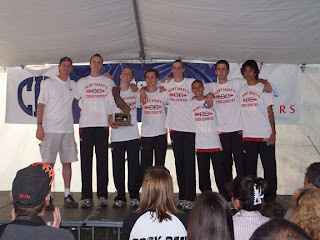 6) Describe the Footlocker national course in San Diego. Some of us may have seen the course live or on the webcast but could you compare the course to any you have raced on this past season? It was pretty muddy and slippery. That was the first time all season that I raced on a course in that condition. It was similar to Stanford in the aspect that your running mostly on grass. It has subtle up hills and then one big hill. 7) Now that cross country is over, when you do you start training for Track and Field? I’m taking this week off to rest and then will begin training next week for Track. 8) What races are you looking forward to in Track? I’m going to concentrate on the 800, 1600 and 3200. 9) If you were to give advice to a 9th, 10th or 11th grader that have aspirations to win a section or state title and maybe more, what would that advice be? Stay focused and consistent with your training. Your training routine, diet and sleep habits need to become a lifestyle. Don’t try and do too much too quickly. You need to build yourself up. A smorgosbord of 10 running websites where you can find everything running related. If you visit any other running websites that are not already listed, please add the site link in the comments below. For those of you that missed the race, here are the highlights that include Ryan Hall making a marathon look like a jog in the park. I am a Physical Education teacher and have coached Cross Country, Track and Field, Basketball, Swimming and Soccer. Through all my experiences with a variety of sports, I have learned that what goes into being a great coach or player is very similar regardless of the sport. Succeeding in any field of life is all about motivation, hard work and keeping true to the values that we as a society determine to be acceptable. Now that Cross Country is over for everybody and you may have some free time to read, here is my recommendation for a great book that is not about cross country or track but will be beneficial just the same. It's by Duke basketball coach Mike Krzyzewski and his daughter Jamie K. Spatola and it's called Beyond Basketball, Coach K's Keywords for Success. In it, they talk about important words in life that are important to all of us and not just in the sports world. Among the words that are covered but not all are Adaptability, Adversity, Balance, Challenges, Commitment, Courage, Enthusiasm, Family, Integrity, Ownership, Respect, Trust and Work. They define each word and use examples from basketball and their family to further drive the point of each word. This is a well done book that is a quick read and highly recommended by me. It's no accident that Mike Krzyzewski is one of the most successful basketball coaches ever. I will certainly be rooting for him as he leads the US basketball team in the 2008 Olympics. The annual Steve Chavez (Murrieta Valley coach) clinic will take place once again this coming year on the first Saturday of 2008. If you are a coach that would like to learn about the training plan and everything that goes into one of the top programs in the state of California, then this is a can't miss opportunity for you. 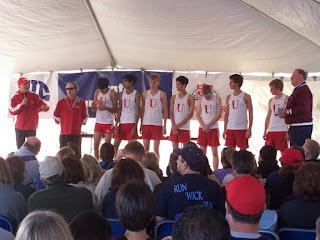 The Murrieta Valley boys are coming off a 2nd place finish at the State Division race as well as a NTN appearance. "How to Become the Coach Your Athletes Deserve--Principles of Developing an Elite Distance Squad"
Cost: $30 includes clinic materials, breakfast and lunch. A DVD with warm-up and plyometric drills is also available for $10. If you want to follow today's race on the web you have two choices. FSN will air an hour-long special of the Foot Locker Cross Country Championships National Finals on Monday, December 17. Check your local listings. I know this is not cross country related but had to add this just the same. Some of you may have heard that a student at our school was recently crowned World U12 Chess Champion. Here are a few links to his amazing accomplishment covered by many media outlets. Petaluma has hopes of a national ranking. The following is Bjorn Griepenburg's account of Petaluma's trip to the Nike Team Nationals this past weekend as they competed in the Open Race and had an outstanding effort. Bjorn, Petaluma's 5th man at NTN, is standing far right on the picture to the left courtesy of Bill Yungert. 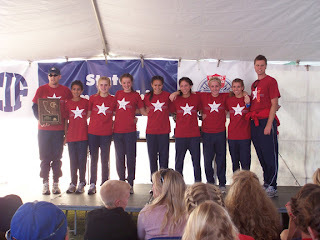 Our team’s trip to the Nike Team Nationals was a perfect way to end a great cross country season. We went up to Portland with the plan to relax and soak in the experience while enjoying ourselves, which we unquestionably succeeded in doing. For Cole Yungert and myself, this represented our last high school cross country race, so we obviously wanted to go out with hard fought races. 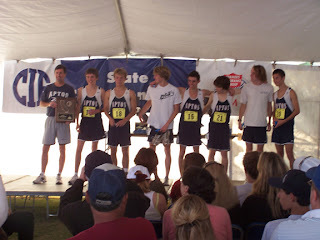 Everyone else did too—after state, the seven of us came together and talked about our race, realizing that no one met his individual goal. I think we were all a bit disappointed with the times we ran, although we were ecstatic at the same time to make the DII podium. Going into the NTN Open race, all seven of us wanted to make up for our races at state and go out on a good note, leaving nothing to regret. 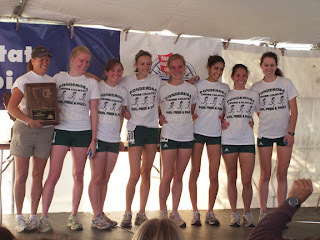 With that being said, we did not approach this race with the same focus that we did for state, and it may have helped. On Friday we ran the course, which was incredibly sloppy. We practiced jumping over the hay bales and running the camel back hills, two of the more unique aspects that, along with the mud, make the course unlike anything else in high school cross country. After a day of sliding around in the mud, we were anxiously awaiting the next morning’s race, despite the “unfavorable” weather forecasts. The weather forecasts had all of us excited. Coming from the Bay Area, Portland’s weather took awhile to adjust to, but we were all wishing for the sloppiest conditions possible. On Friday night the forecast for our race was low 30’s with snow. We watched a movie and joked around, keeping our minds off of the race. We woke up early Saturday morning and piled into our vans to head over to the course. It was snowing when we got there, the first snow any of us had seen in quite some time. Unfortunately, it stopped snowing by the time our race began. There is nothing that can describe the Portland Meadows course. There are a number of areas with standing water, including “the lake,” a portion of ankle deep water that stretches about 50 meters. The entire course is on mud and grass, both of which slow runners down dramatically. The race itself was probably the most fun one I will ever be involved in. We finished fourth, behind the Kenyans, Vista Murrieta, and Crescenta Valley, three great teams that helped provide the race with some high quality competition. I don’t think there was any disappointment in the performance. All in all, it was a great experience, and a great way to cap off my high school cross country career. Good luck to everyone in winter training and track. 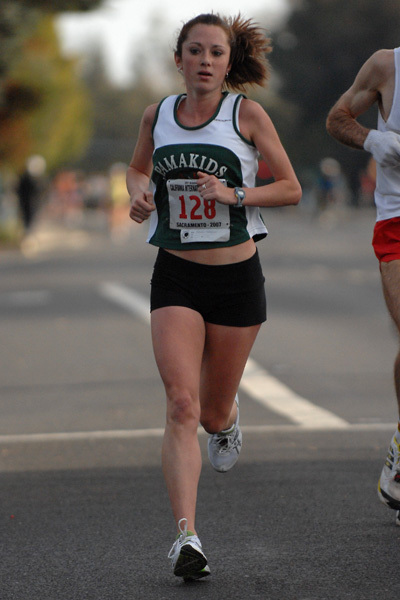 The link below is the press release on former Sacred Heart Cathedral runner Michelle Gallagher's effort on Sunday, December 2nd, as she ran 2:43:30 at the California International Marathon (CIM) in Sacramento to qualify for the United States Women's Olympic Trials Marathon. Picture to the left was taken at the race by Michelle's mom, Margaret Gallagher. Congratulations to one of the best female high school runners in Northern California history for her well deserved accomplishment. I was able to take 5 of my top 6 girls to Portland for the NTN. I had registered them for the Open race, and after the long season and the State Meet we were hoping for just a road trip with a race, the Kenyans, and some shopping to go along with it all. The trip, the hotel stay, the race, the shopping, and the college visit were all very nice. We had a great time being silly and driving around Portland to various sites and activities. Portland apparently has only one major mall, the Lloyd Center, but it was enough for my girls to the point we visited it three times. The ice skating the last day was a high point. Evidently shopping, even just mall cruising, is enough for young women to occupy time. Meanwhile, I was trying to find a TV set to watch a football game. However, there is a big fly in this ointment. The Nike people gave the 44 championship teams the royal treatment. They were flown in and housed and fed and transported in fine regal style. They were given individualized uniforms, team sweats, Nike garb,trinkets, and entertainment and hospitality and remarkable access to the Nike campus center. There were Nike officials, world class athletes, Olympians and all sorts of luminaries for these kids to meet and socialize with. They were even given hospital foot booties to place over their muddy shoes after the course runs on Friday so the shoes wouldn't muss the charter buses on the way back to the team hotel. Not that I resent this treatment, nor do I wish to doanything but applaud NIke for putting out this lavish soiree on the part of the athletes. It is just that the participants in the Open section got almost no notice at all. After all, the only reason for the Open race is to give the Kenyans someone to beat in a race since they can't run in the championship race. to buy Nike gear if we wanted ($20 a t-shirt at the bottom end). And then it was nearly impossible to get close to the Kenyans to even chat without being made to feel like we were intruding. But I don't want to gripe too much. The girls felt very good about their race, we had our own sent of activities and those were lots of fun, and the consensus is that this was a worthwhile road trip and we should do it again next year. Which we probably will. I enjoy the idea of a national championship race, and the generosity of Nike in bringing it about. The chance for my girls' team to be part of a national top-level scene like that is remarkable, and well-worth the money. Something like this is exactly what is needed to make them all feel better about being runners, and reinvigorate them to be better runners. The "At Large" Standards are listed below. High Jump 6' 06" 5' 05"
Pole Vault 14’ 10” 11' 09"
Long Jump 22' 08" 18' 03.75"
Triple Jump 46’ 03”" 39' 00"
Shot Put 57' 04.75" 40' 11.25"
Discus 172' 05" 136' 01"
The book, 100 Miles to Destiny, was written by Serra Cross Country Coach Willis McCarthy. It was six and a half years in the making and worth the read. "Mr. Will McCarthy, chemistry teacher and cross country coach at Serra High School in San Mateo, CA has a great story to tell – a story of passion, a story of the human spirit. So he says in the opening of his preface in his self-published work of fiction, 100 Miles to Destiny, a Novel on Running. McCarthy writes, “In the year of our Lord one thousand nine hundred eighty-four, three hundred seventy men and women assembled at the base of Squaw Valley near Lake Tahoe to participate in an inaugural 100 Mile Endurance Run World Championship. I was one of the participants. 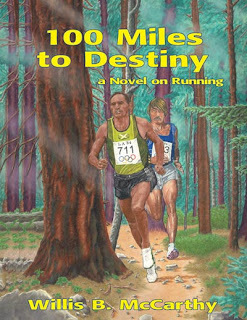 The 1984 race, the eighth edition of the Western States Trail Run, spawned the idea of this novel.” An avid runner for twenty-five years, Coach McCarthy has run races of half mile track runs to 100 mile endurance runs, and after concluding his running career in 2000 he took up writing. Taking creative writing classes at College of San Mateo, plus working part time on the novel for six years between his commitments of parenting, teaching and coaching, he completed the novel last summer. Thank you to all of you that have contributed in any way to this blog. I will keep posting through the winter period and during Track and Field season. If you have anything you would add to the site such as newspaper and/or running links, please send them to albertjcaruana@gmail.com. 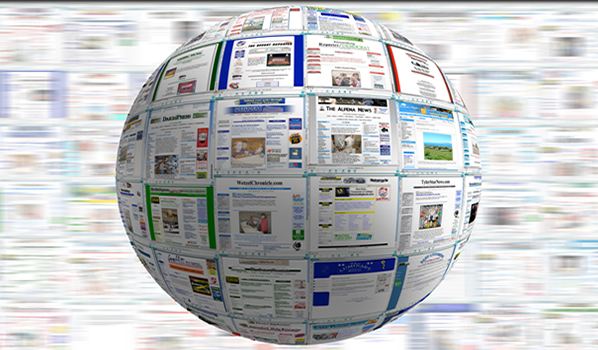 If you would like to contribute an article to the blog, feel free to email me as well. Your audience is full of runners, coaches and parents who are all big fans of Cross Country and Track and Field. Congratulations to so many cross country runners this past fall season. Let's keep the momentum rolling to Track and Field season and beyond.